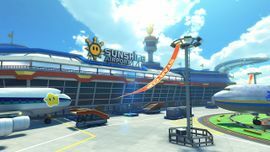 Sunshine Airport is the first course of the Star Cup in Mario Kart 8 and Mario Kart 8 Deluxe and is the first airport course in the Mario Kart series. It takes place in an airport on Isle Delfino. Airplanes can be seen parked and taking off. Sunshine Airport is themed and named after Super Mario Sunshine. Shine Sprites are visible throughout the course. The course physics are altered in 200cc, with the ramps with boost panels propelling players at a shorter distance. The airplanes/jetliners that are all around the airport resemble the Boeing 737, 747, 777 or even 787 series of aircraft. The course begins in the terminal. After a hairpin turn, players will exit the terminal by taking a jump onto the Tarmac. After this, there is a small jump over a conveyor belt, after which the track proceeds under the Boeing 747. Once passing under the 747, a ramp leads to a raised track which then turns left. The track then splits into two alternate paths; one where a jump can be taken onto the wing of a plane, proceed through it and come out on the other wing, or one where the jump is not taken so the player drives under the plane. Shortly after, players will take a left turn, and then hit some boost panels leading to a gliding section, where a plane flies over the lead racer. This plane changes every lap. The gilding section travels up into an anti-gravity platform suspended in the air, which loops around a three quarter turn, into to another gliding section. Players descend, land on a helicopter pad outside the terminal, then turn left and re-enter the terminal. There is one last right turn to the finish line. At the finish, a departure board can be seen on the right, including names of other tracks, being among others Dry Dry Desert and Sweet Sweet Canyon. On the screens around the inside of the airport, a list of departures to other courses, such as Shy Guy Falls and Thwomp Ruins, can be seen. Posters of Water Park can also be seen. When under a plane, sounds in the game get quieter. One can cut off the left turn before the first gliding section if one uses a speed boosting item in the correct place. The left turn into the terminal can be cut off if one boosts through the grass. One can drive through an area with conveyors carrying luggage cutting off the final turn. The crates may contain Mushrooms. The staff ghost for this track is Rosalina on the Circuit Special, and the time is 2:24.429. The Mario Kart 8 Deluxe 200cc staff ghost is Luigi with a time of 1:45.437. At one point a couple of the Koopa rock formations from Koopa Troopa Beach in Mario Kart 64 and Mario Kart 7 can be seen in the background. "This is the final boarding call for Boomerang Bros. International Airline, Flight 117a to Sweet Sweet Canyon, departing from Gate 3." This is inconsistent with the board before the finish line, which says flight "Sweet Sweet Canyon BBIA 4300." "Passengers departing on Galaxy Airlines, Flight 2580, bound for Dolphin Shoals, should proceed to customs and immigration at this time." "Paging Galaxy Airlines, Flight 2218, passenger Ms. Birdo, please proceed to the information counter on Floor 2." Some of the crates on the conveyor belts have panels which resemble ? Blocks, Empty Blocks and Brick Blocks. Mario, gliding off of the final gliding point in the course. The Koopa Troopa rock forms from Koopa Troopa Beach can be seen in the background. A Sunshine Airport patch appears on the back of the Racing Outfit in Super Mario Odyssey. This page was last edited on February 11, 2019, at 14:12.